Mustang GT Takeoff Mufflers are a quick, easy and cheap way to improve the sound and looks of your 2005 and newer Ford Mustang V6. Replacing your stock V6 Mustang muffler is extremely easy and here's how you can do it yourself in about 30 minutes or less. Here's my 2006 Mustang GT takeoff muffler, sitting beside a 2005 Mustang V6 muffler. Other than one extra bracket, there is very little difference externally. One nice difference you'll see though, is that the GT muffler is stainless steel and has a nice large chrome tip. 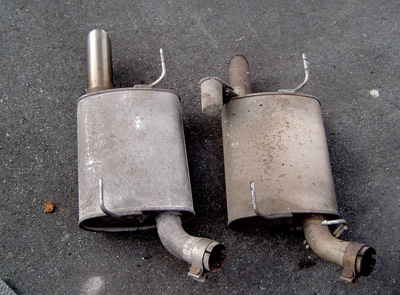 If you don't like the cabin noise from an aftermarket performance muffler or the price, a GT takeoff muffler is a great way to enhance the sound and looks of your late model V6 Mustang. The Mustang GT exhaust system was designed to flow freely and give that distinctive and powerful V8 sound. Plus, it was apparently designed to flow well with engines up to 450 horsepower. At idle, the sound is very much like the sound of an idling 4.6 liter V8 or even the new 5.0 liter Coyote engine. And for between $50 and $100 bucks, and a half hour's work, you just can't go wrong. Like I said earlier, this is easy stuff! 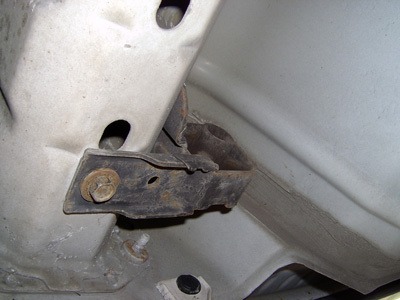 The three attachment points are for the exhaust hangers. Because the one closest to where the muffler bolts to the mid pipe is not going to be used, we will remove the rubber bushing that joins the muffler to the steel hanger. The best way I've found to get this all apart in the shortest amount of time, is to first remove the connector for the exhaust to the muffler. 1. It's time to remove hanger bolts. 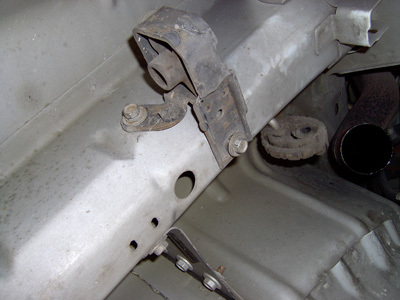 While you may not need all of them out to pull out the metal arms that are welded to the muffler, it will make it much easier. There are only one or two that are somewhat difficult to reach. 2. 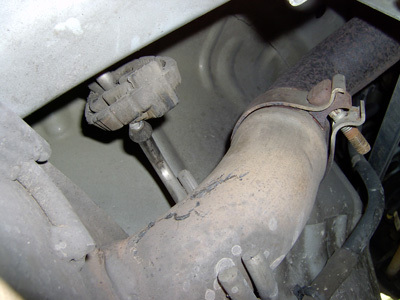 With all the hangers either loose or removed, wiggle the old muffler around until it pulls away from the exhaust pipe and remove it. Installation is almost the reverse of removal. 6. Enjoy your new Mustang GT sound!